On March 8, members of “Tomando Control de su Salud,” Spanish for “Taking Control of your Health,” gathered in the basement of the Nativity of our Lord Church in South Scranton. 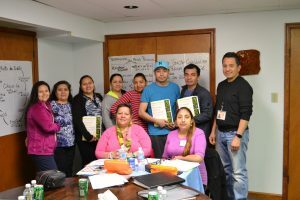 “Tomando Control de su Salud” is the Spanish-language version of United Neighborhood Centers’ (UNC) innovative, evidence-based Chronic Disease Self-Management Program (CDSMP), which uses trained community health workers to educate individuals and their caregivers with chronic diseases on how to better manage their illness. UNC’s community health workers, many of whom suffer from a chronic illness themselves, are certified through Self-Management Resource Center, to offer the programs in both English and Spanish, as well as to focus on specific topics, such as diabetes and pain management. Participants make weekly action plans, share experiences, and help each other solve problems they encounter in creating and carrying out their self-management program. Physicians and other health professionals have reviewed and approved all materials in the workshop. Some topics include: healthy eating; appropriate exercise for maintaining and improving strength, flexibility, and endurance; managing depression; appropriate use of medications; and more. UNC is pleased to be offering the Spanish version of this program in Northeastern PA. If anyone would like to learn more about or participate in this program or other specific workshops, or to schedule one for an organization, they can contact Meredith McCracken at 570-880-7130 ext. 115 or mmccracken@uncnepa.org. Pictured are class participants and the facilitators. Standing from left to right are: Angeles Youells, Gabriella Monteczuma, Rosalba Olmedo, Yanet Garcia, Escolastica Fernandez, Carlos Aroche, Mauricio Madariega, and class facilitator Alejandro Stefani. Seated from left to right are: class facilitator Josefina Lowe and Rosa Naula.